A programme for the First Concert of the Orlando Choral Union at the Orlando Opera House, held on Monday, April 13, 1891. Located on 119-125 South Court Avenue, the Opera House was owned by Charles Weimer and built by N. C. Stubblefield in 1884. Original program, 1891: The Daily Record Print, Orlando, Florida: Private Collection of Thomas Cook. Digital reproduction of original program, 1891: The Daily Record Print, Orlando, Florida. Originally published by the Daily Record Print. Copyright to this resource is held by the Daily Record Print and is provided here by RICHES of Central Florida for educational purposes only. Monday Evening, April 13, 1891. 1. Piano Solo. . . . . . Overture to Midsummer Night's Dream. 2. Chorus. . . . . . .Oh, Hail Us, Ye Free. 3. Address. . . . . . . .On Modern Music. 4. Sestette--Stay, Prithee Stay. . . . . . Sir H. R. Bishop. 1st Soprano, Mrs. A. F. Odlin; 2nd Soprano, Mrs. S. L. Ross; Alto, Mrs. J. L. Guernsey; 1st Tenor, Mr. Geo. R. Newell; 2nd Tenor, Mr. A.F. Odlin; Bass, Dr. Chas. F. Shine. 5. Barytone Ballad. . . . . . . . . . . .The Warrior Bold. 6. Chorus. . . . . . . . . . . . . . . . . . . . . German Volkslied. 7. Declamation. . . . .. . . . . . . . . . . . The Famine. 8. Trio for Female Voices. . . . . . . . . Gently Fall the Dews of Eve. 1st Soprano, Miss Shine; 2nd Soprano, Miss Caldwell; Alto, Mrs. Starkey. 9. Piano Duet. . . . . . . . . . .. . . . . . . . . . . .Calif of Bagdad. MISS KILMER AND PROF. WARD. 10. Part Song. . . . . . . Fair is the Night. . . . . . . . . . J. C. Macy. 11. Soprano Solo. . . . .Good Night, Sweet Dreams. . . . . .Bischoff. 12. Declamation. . . . . . . . . . . . . . . . . . . . . . . . .The Old Leader. 13. Chorus. . . . . .. . Allegiance we Swear. . . . . Sir Henry Bishop. 14. Tenor Solo. . . . . The Rhine Maiden . . . . . . .Smart. 15. Quartette. . . . . . The Parting Kiss. . . . . . . .Ciro Pinsuti. Soprano, Miss Irma St. Clair-Abrams; Alto, Mrs. R. F. Starkey; Tenor, Mr. J. M. Cheney; Bass, Mr. Carl Warfield. 17. Chorus. . . . . . . . . .Softly Treading. . . . . . . . . . Arr'd from Meyerbeer. 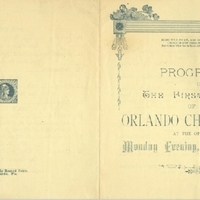 “Programme of the First Concert of the Orlando Choral Union.” RICHES of Central Florida accessed April 19, 2019, https://richesmi.cah.ucf.edu/omeka/items/show/1010.